Tent weddings can be absolutely magical. We are so excited when we are asked to be part of an event team that creates such an amazing and beautiful experience for a wedding couple, their families, and their guests. We were asked to be the caterer for a wedding in July of 2013 that was going to be held just west of the city in the Springbank area. The home and the land surrounding it were stunning with beautiful views of the mountains. The planner behind this wedding was the creative and lovely Shannon Valente of Shannon Valente Weddings. 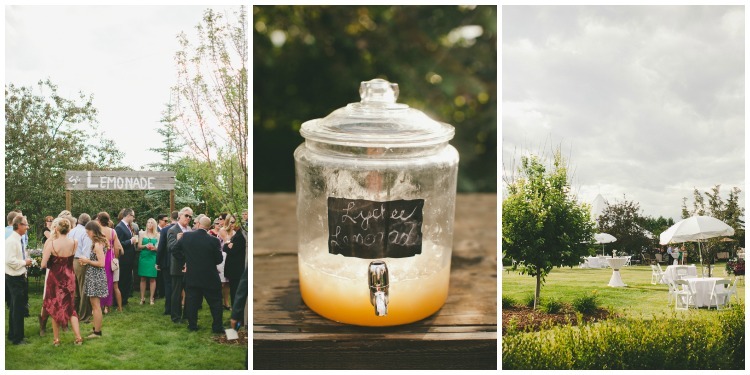 The stunning property was transformed into a perfect venue for a summer wedding reception with beautiful lighting, luxurious flowers, crisp white tents and even an antique barnboard lemonade stand created just for the reception. To see more photos of this beautiful Calgary wedding and learn more about Shannon Valente please check out her beautiful website. The stunning photographs were taken by Shari+Mike Photographers. The tents, tables, chairs, dance floor, dishes, and glassware (and more!) were provided by the always amazing Special Event Rentals. There is also a beautiful post in Wedding Bells with more photos. Great weddings don't just happen - but they sure do when you pull an amazing team of people together. Collaboration is key! Roasted scallop with crispy prosciutto - a beautiful and delicious small bite for your guests to nosh on before dinner. If you are recently engaged and just starting to plan your wedding, be sure to check out this post '5 secrets to wedding success'. There are so many Calgary caterers to choose from, it can be tough to know where to start. Here are 8 things you should know before you hire a Calgary caterer. And if you are planning a summer weddings there are some fun summer wedding trends in Calgary . Calgary outdoor weddings can be truly stunning when everyting comes together. Please call us to today so we can get started!